Exclusive offer to Brambleton residents as part of the Bram Life Pass program. The most convenient and affordable dry cleaning service in the area with FREE Pick Up and Delivery – just got a whole lot more affordable for Brambleton! 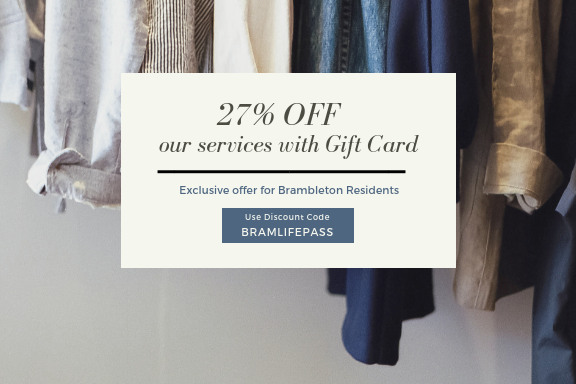 As part of the BRAMLIFE PASS we have an exclusive offer for Brambleton Residents. Purchase a Washly GIFT CARD and enter discount code “BRAMLIFEPASS” which will give you 27% discount. You will receive an email with your Washly eGift Card. Enjoy concierge Laundry Service by Washly! Customers are required to load a minimum amount of $30. You have to use the gift card for payment of services to take advantage of the offer and the payment is due at the time of pick up. We cannot apply gift card balance towards invoices.